How long would you like this delivery to last you? Is this your first time ordering a delivery through us? If you order any frozen raw products you must leave a cooler out. We would be happy to provide a cooler for delivery rotation for a $10 deposit fee. Would you like us to provide a cooler? How many bags of treats total? Bulk bag of bully sticks? Bulk bag of piggy skins? Save Money with a Package! Each package is specially designed with your dog in mind. Best for large breeds and avid chewers. 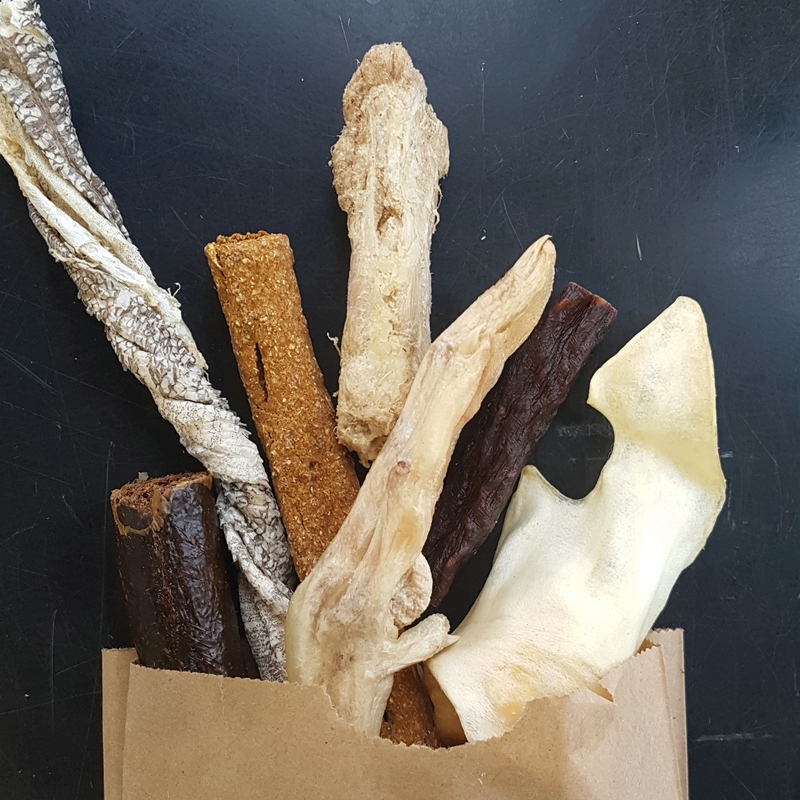 Seven large chews, with a variety of ears, skins, and sticks. 5-10 chews based on your dog's size and diet, specifically chosen to keep those teeth and gums at their best. For the little ones, we'll prepare 7 fun-sized treats! Best for dogs between 10-20lbs. Five varied chews, a bag of treats, and two rolls of poo bags. All sized and flavours suited specifically to your dog! Please note, different chews will last different amounts of time. The packages are meant to provide your dog with a varied diet, so expect to see a difference in the size and time spent chewing each one. Feedback is always appreciated! If your dog is on raw food and you'd like to receive raw bones, select a custom package and enter the types of bones you'd like in the box provided. If it is your first time giving your dog a particular chew, please monitor them. Add on a box of poo bags? Ready to go? Once you hit submit, our administrator will be in touch to confirm your order details and date.